The Run Manager, shown below, is used to perform InfoSWMM H2OMap SWMM InfoSWMM SA simulations and to manage simulation output sources (results). When you run a simulation, InfoSWMM H2OMap SWMM InfoSWMM SA uses modeling data associated with the currently active scenario. If you have not developed a custom scenario, the *active* scenario is the “BASE”. To run a model based on a different scenario, activate the desired scenario using the Active Scenario command and then use the Run Manager to perform the simulation for the selected scenario. Use the Report Manager to see simulation results in either report or graph formats. Launch the Run Manager by selecting Run Manager from the InfoSWMM H2OMap SWMM InfoSWMM SA Tools Menu Tools Menu or by clicking the Run Manager button ( ) from the InfoSWMM H2OMap SWMM InfoSWMM SA Output Tool Bar Standard Toolbar . Content of the Run Manager are described below. Output Source An output source is an association between InfoSWMM H2OMap SWMM InfoSWMM SA and the output (.out) file created from a simulation run. InfoSWMM H2OMap SWMM InfoSWMM SA refers to model runs as output sources, whether they be *active*.Standard or ScenarioX.Standard, every model run is affiliated to an external output file by its "output source" name. Name – name used for the output file. After a model is run, the most recent simulation run results are referred to as the *active* output source. Reference – the reference used to describe the output source. It is not customizable. Report Opens and enables viewing of an output text report. The name of the report is "HYDQUA.RPT". Open Opens and loads an output file in to the model, and activates this output file. Save Saves the most recent model run to a file specified by the user. Once saved, the (.out) file can be open or loaded at any time. Update Relate Update existing output relates to the recent run output. Force Reset Removes all simulation results from the highlighted output source. Model results for the output source will not be available until the user loads and relates a current (.out) file to the output source. OK Accept all changes and close the Run Manager dialog box. Load Output Source Loads an output source. Output sources are either internal (a model run from a scenario) or external (a model run prepared by someone else in another InfoSWMM project). Edit Name Allows the user to customize name for an output source. Remove Output Source Removes an output source from the Run Manager. The removed output source can be re-created through the Load Output Source icon. Remove All Output Sources This will remove all output sources (excepting the *active* output source that can never be removed). Once all are removed, they can only be re-added either by running each of the specific simulations or by clicking on the Load Output Source icon. Simulation Options This opens the simulation option editor and enables the user to modify/edit the InfoSWMM simulation options. The simulation option editor can also be initiated from the operation browser. Climatology Settings This opens the climate data editor and enables the user to modify/edit the climate data. The climate Data editor can also be initiated from the operation browser. Run Manager Report Options Open the simulation report editor and enables the modeler edit/modify the simulation report settings The Simulation report editor can also be initiated from the operation browser. Use Simulation Task Manager Schedule a simulation using Run Manager. Notice that the Run button has changed is now the Schedule Simulation button ( ). After clicking this button, the simulation is sent to the Simulation Task Manager and the Simulation Task Manager Main Window will be launched. The simulation can further be managed from there. Note: When a simulation is run within the Simulation Task Manager environment, a copy of the input data is made as input for the simulation task. This means that after scheduling the simulation task, you can change the input data in the model but future output results may differ. User 32 Bit (Default) or 64 Bit Engine If you use the Simulation Task Manager you have the option of using either a 32 bit or 64 bit engine. Activate the Scenario that you want to run. Launch the Run Manager by selecting Run Manager from the InfoSWMM H2OMap SWMM InfoSWMM SA Tools Menu Tools Menu or by clicking the Run Manager button ( ) from the InfoSWMM Output Tool Bar Standard Toolbar . Specify the desired simulation and report options, and climatology settings and click on the Run icon to run the simulation. Check the Run Manager Run Status indicator and confirm a green light.. If you get a Red light or a Yellow light click on the Report icon next to your Run icon on the Run Manager dialog box to trouble shoot. After a successful simulation, review your results using the Output Report Manager. 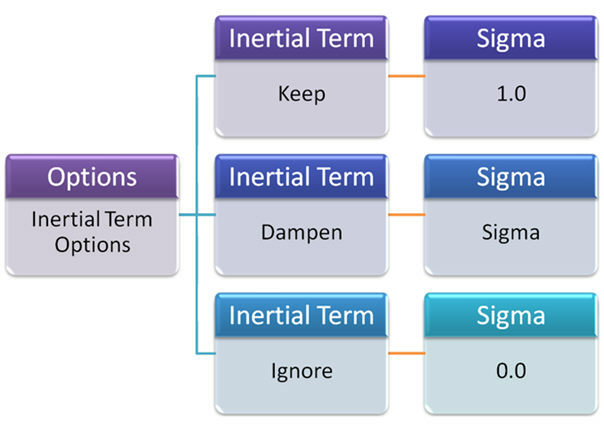 Figure 1 shows how Sigma is set based on the user selection of the Three Inertial Terms. Figure 2 shows how Sigma is calculated for the Dampen Option. If you use Ignore then dq3 and dq4 are ignored all of the time, if you use Dampen then dq3 and dq4 are used for a Froude number less than 0.5 and then the terms gradually fade away until a Froude number of 1 is reached. If you use Keep then the non linear terms are used all of the time no matter the value of the link Froude Number. There is one exception to this rule: If a closed link is full then the value of sigma is set to 0.0 no matter what is selected for the Inertial Term. Figure 2. 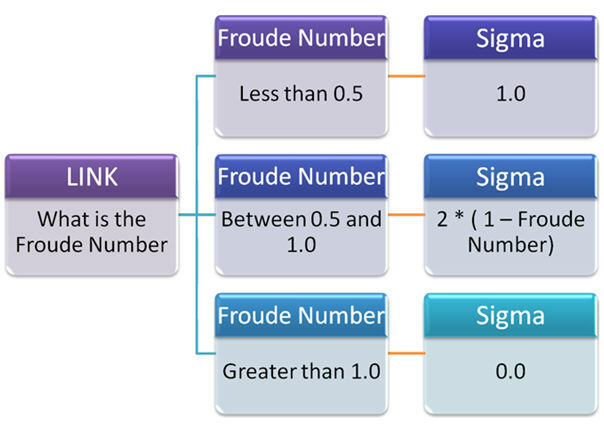 At each iteration for each link during the simulation the link Froude Number is calculated and based on the Froude Number the value of Sigma is Set. This note shows the relationship between the terms dq1, dq2, dq3 and dq4 in the SWMM5 code and the St. Venant Partial Differential Equations.